Lyon City Boat, les "Bateaux Lyonnais"
Les Bateaux Lyonnais (Lyon City Boat) offers wonderful sightseeing and lunch or dinner cruises along the Rhone and Saone. From a simple one hour sightseeing trip to a relaxing 5 hour gourmet lunch journey, see the city from a different angle as you drift past the magnificent urban landscape on a guided tour. A river boat cruise through the centre of Lyon with an entertaining onboard commentary is a unique way to discover Lyon. It’s a relaxing moment away from the traffic as you drift along the beautiful waterways admiring the impressive views. 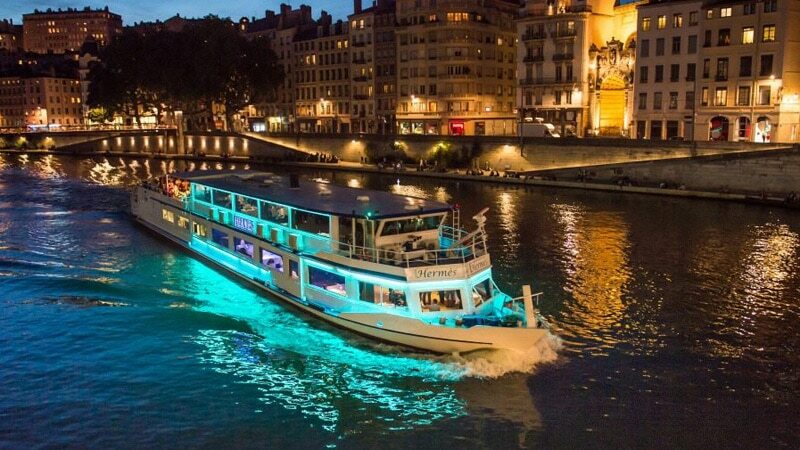 Since 1984 Les Bateaux Lyonnais has been taking passengers along the two rivers that pass through the heart of Lyon. There are six different boats available and the smallest is the 40 person capacity “St Jean” which is perfect for a short one hour sightseeing trip with cocktails. 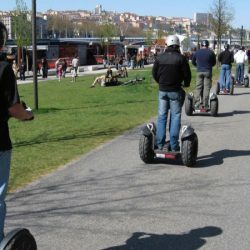 There several options including a “discovery tour” which heads north along the Saone to Ile Barbe, an oasis of greenery on the outskirts of the city or the “offbeat tour” which points out Lyon’s impressive architecture including views of the Basilica of Notre Dame de Fourvière as you drift past Vieux Lyon. You can also take a trip south along the Saone to the Confluence Museum and your ticket includes priority access to the museum. The largest of the company’s boats is the flagship “Hermès”. It’s a beautiful restaurant boat which is available for longer gourmet lunch and dinner cruises. You can choose between a two and half hour lunch or dinner excursion or a five hour lunch cruise. The Hermès offers an “authentic menu” or a “gourmand menu” and both offer a choice between two main courses. There is a also vegetarian menu, a children’s menu and a special birthday menu. 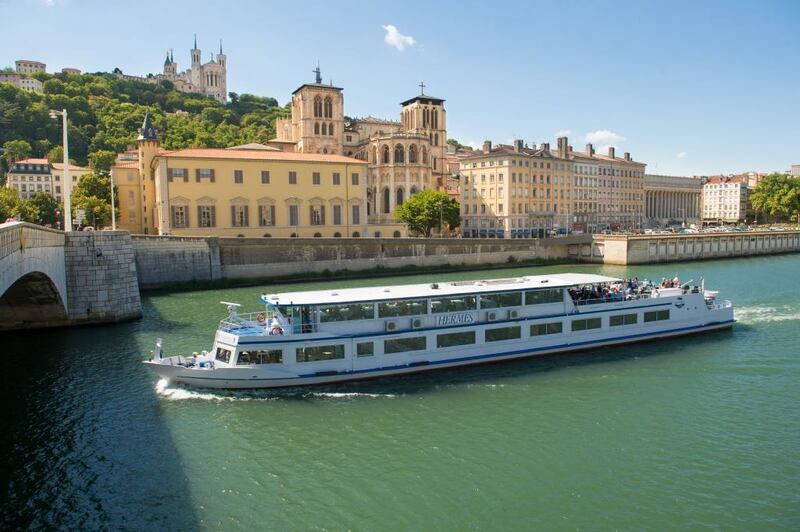 The one hour sightseeing cruises depart from the boat landing opposite 2 Quai des Célestins Lyon 69002 which is on the left bank of the Saone at the foot of the Passarelle du Palais de Justice. It’s just a short walk from Place Bellecour. The lunch and dinner cruises depart from the left bank of the Rhône river, at the foot of the University Bridge opposite 16 quai Claude Bernard, Lyon 69007. Les Bateaux Lyonnais tours are available on most days and departure times vary depending on which tour you would like to take. For exact times and days available please enquire at the ticket office which is open from 9am to 12am and 2pm to 6pm and located at 13 bis quai Rambaud, Lyon 2 or see the website for details. luctus ut elementum commodo diam consequat.